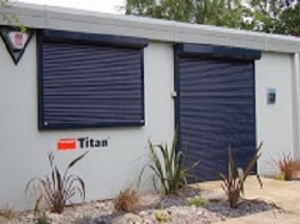 Insulated security shutters are used in low to medium security situations and are available in various slat sizes and colours, offering good heat & sound insulation and sunlight shading. Manual and automated operation options. Made to measure. The foam-filled 43mm deep, 6mm thick aluminium lath from which this shutter is made offers light duty security. Popular on back windows and patio doors in domestic applications. The slats can be vented or unvented. The vented version allows air circulation and some light into the room but maintains security. Popular with customers taking their shutters to their overseas holiday homes. Can be operated a) Manually by neat pull cord inside the building, b) Manually from outside by means of spring & lock in bottom lath (heavy duty extruded for extra strength), c) Electrically from internal wall switch, or d) Electrically via remote control hand transmitter (at nominal extra cost). Fully powdercoated aluminium box and guides makes the installation neat, clean and compact. Box size varies according to height of shutter...upto 1200mm total height, including box = 150mm box, upto 1600mm = 165mm, upto 1800mm = 180mm, upto 2400mm = 205mm and over 2400mm = 250mm. Can be installed inside or outside the building. For commercial grade high security version of this shutter at little extra cost, select the "Heavy Duty" version in the "Security Shutter" sub-menu at the top of the page. All made in the UK. Multiple orders enjoy additional discounts.